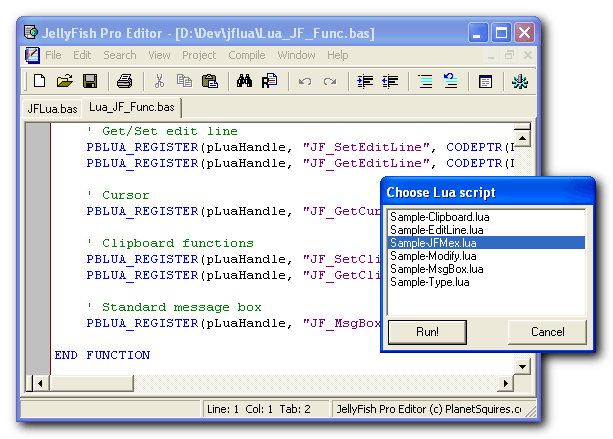 JFLua is a plugin for JellyFish Pro that add the ability to write Lua scripts that interact & control the editor. You can write scripts that do anything from displaying a simple messagebox, to move the cursor, cut & paste blocks of text, modify the currently edited source (think about a source code formatter), compile it, automate repetitive editing tasks (sort of powerful macros) and so on. When JFLua start, it simply let you choose witch script to run. The list is composed with every *.Lua script found in the directory "$JellyFishBaseDir\PlugIns\Plugins\JFLuaScripts". * Fixed warning messagebox for Lua errors.